It took me some time to find Tiffin Box Etc (TBE) in BKC, Bandra as it is inconspicuously located on the ground floor of a commercial building, nonetheless the landmark is the Dimsum restaurant Yauatcha, and it’s just behind it. TBE is an Indian restaurant which gives you a glimpse of regional Indian cuisine and Balti dishes from England in a very casual setting. First look at the bench seating in the restaurant spoke about the fast paced environment they operate in. 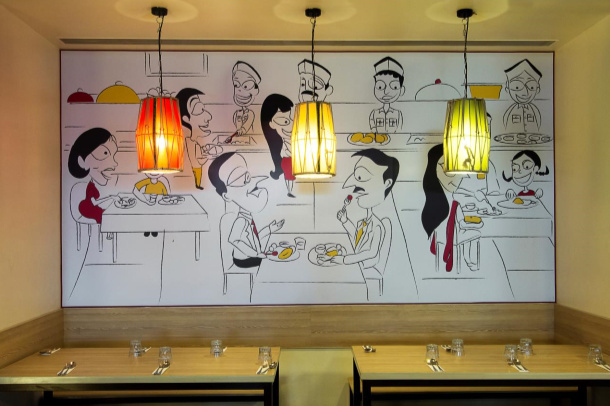 It is day lit with Bollywood songs playing in the background and the colorful caricatures adorning the walls only add to the contemporary and chirpy ambience. I was there for lunch on a Friday and the restaurant was doing very brisk business considering they were in the first week of operation. 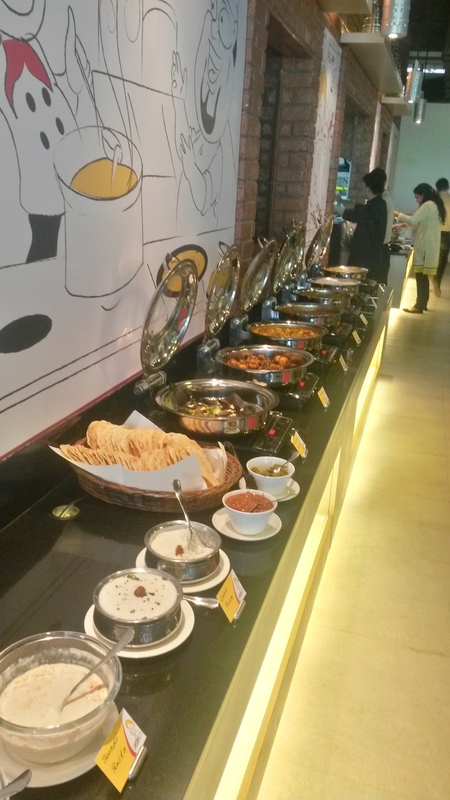 ‘The word about our Indian buffet at INR 400 all inclusive complete with salads to desserts is spreading real fast. You cannot get a better deal than this in BKC’ asserted Anindya the operations head. TBE has a Snacks menu running from 0800- 1800hrs, a chat menu from 1600-1900 hrs and they do a full dinner menu post 7 in the evening. 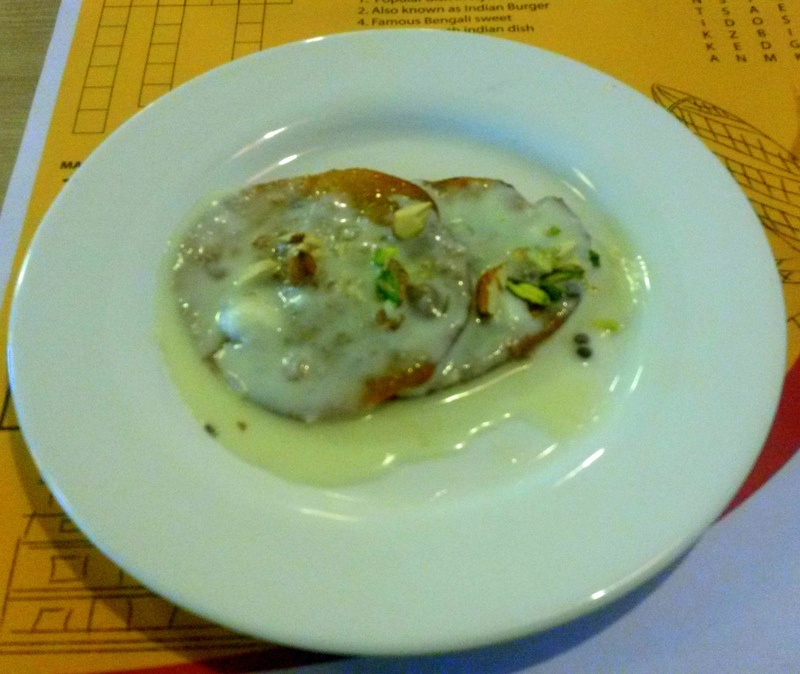 From Idlis (RS 60) to Vadapavs (Rs 60) to Couscous Upma (Rs 90) to Parathas (RS 90) the snacks menu has fair number of options, the Chat menu has 4 options but good enough to attract people for an evening snack and the full dinner menu gives you options of Tandoori Mushrooms (Rs 180) to Ker Sanger ki Sabji (Rs 180) to Punjabi Dum Aloo (Rs 160) to Dum Biryani ( Rs 210). They also do set meals for dinner and it comes to you in an Indian compartment style tiffin box. Since it was an invited review, I could solicit some dinner items from Chef Azad during lunch hours. 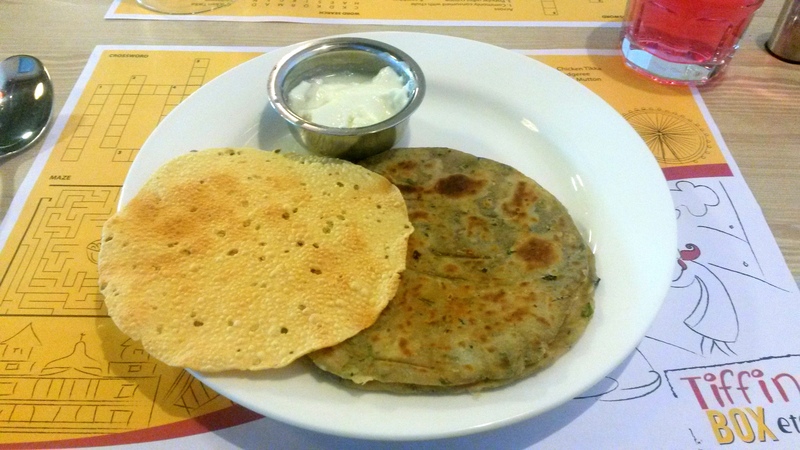 I started with a Koki Dahi Papad (RS 80) a Sindhi specialty, Koki is a roti made with whole wheat flour kneaded with Methi leaves, onions, chilli, ghee and spices and griddled. It can be had on its own and this case served with curd and papad. They were very rich hence filling. A Punjabi lassi (Rs 80) after this and I would have given in, I chose to resist the temptation. 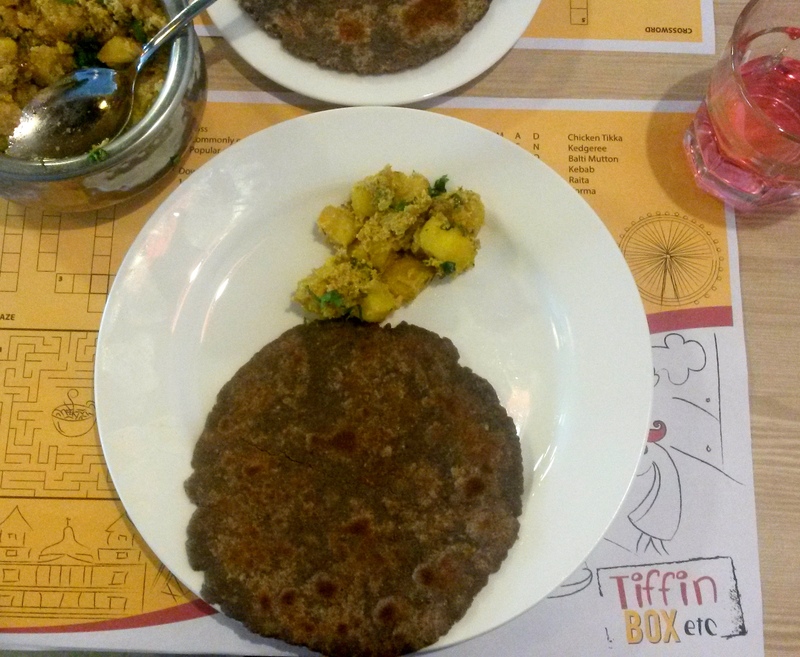 For mains was the piquant Rajasthani Gatte ki Sabzi (Rs 180) and a Bengali favourite, the grainy and cumin forward Aloo Poshto (Rs 160) and I preferred Nachini (Finger Millet) rotis to go along. The food came in good portion and was in minimal oil like home. I ended my meal with a rich homemade Malpua and Rabdi (Rs 150) and washed it down with a presweetened filter Kaapi (Rs 40) which was too sweet for my palate and also lacked in flavour. Limited a-la-carte options for lunch leaving one with a choice of buffet for mains. 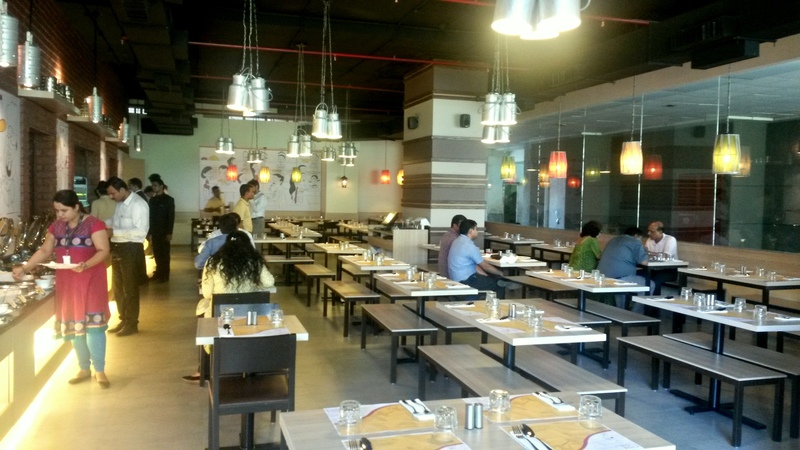 BKC has been blessed with an eatery so economically priced filling in a huge gap that exists. Sure they will set a trend for more of such cheerful restaurants. Lastly I only hope that they sustain the pricing. P.S: Mallus rejoice! They also serve you ‘pink’ water or Karingali vellam. And yes they do serve non-vegetarian food. 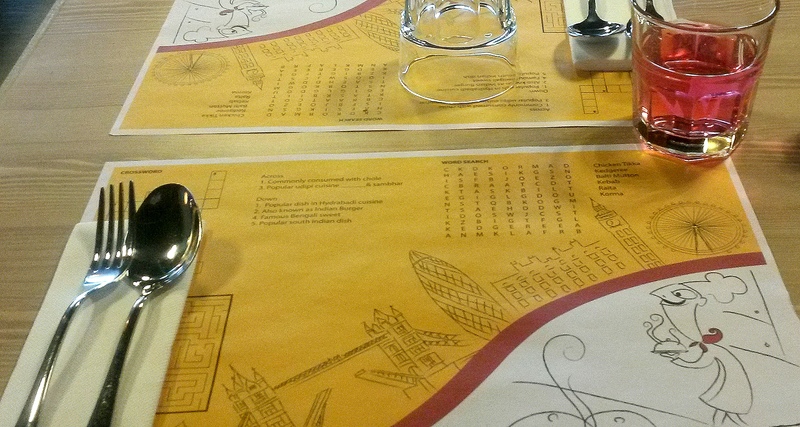 Yeah iit gives you some options like Ker sangri and Sai Bhaji which are uncommon….